A tavern? This is our kind of crowd. 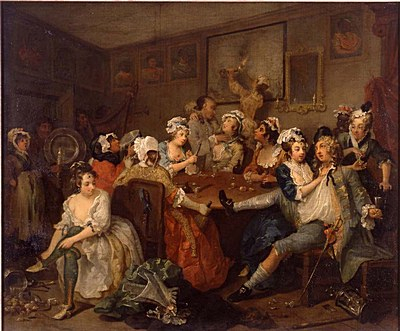 The Rake’s Progress 3: The Tavern Scene by William Hogarth, 1734. Fans of good food (you) and local history buffs, rejoice! Three Flags Tavern is open. Located in the old Harry’s on Southwest (remember the 99 bottles of beer on the wall? ), Three Flags is the brainchild of the delightful husband and wife team, John and Cathy O’Brien. The restaurant’s name pays tribute to the two-day ceremony in 1804 that commemorated the passage of the Louisiana Territory from the Spanish (flag 1) to French (flag 2) and finally to the United States (flag the third). The O’Briens’ menu reflects all three of these culinary traditions, plus a few dishes inspired by Native American cuisine. When we met John and Cathy, they had a robust concept for food, drink and theme, and they let us use the space to embody their menu and style. Bar vignette. 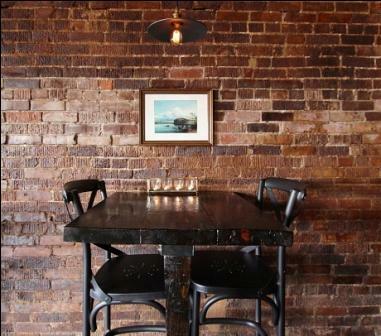 SPACE designed and built the rustic bar-height tables. A Karl Bodmer landscape is featured at each table. This was a fun challenge for SPACE. We usually specialize in contemporary and modern architecture, so designing a more traditional interior that pays homage to St. Louis’ deep visual and cultural history was something brand-new for us. 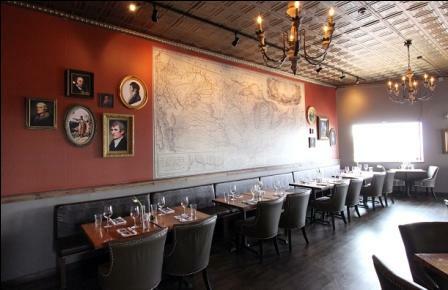 View of the 14-foot-wide Karl Bodmer map in the dining room. 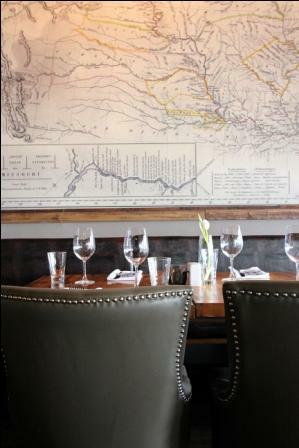 When you walk into the dining room, you can’t miss the 14-foot-wide Bodmer map on the dining room wall. Why is this map so special? [Beware: History lesson alert.] For many years, it was considered the finest map of North America. Swiss artist Karl Bodmer accompanied naturalist Prince Maximilian of Wied-Neuwied (“Prince Max”) and his servant/hunter/taxidermist David Dreidoppel across North America between 1832 and 1834. This group — a scientist, an artist, and a hunter-taxidermist — was the explorer’s A-Team because with their combined skills they were particularly well-suited to record the landscape, flora, fauna and people they encountered along the way. In addition to the usual physical characteristics, Map to Illustrate the Route of Prince Maximilian of Wied in the Interior of North America from Boston to the Upper Missouri in 1832, 33 & 34, shows the locations of native tribes and trade routes. (Prince Max’s expedition is shown by a red line.) Incidentally, Bodmer was revered for his authentic representation of Native Americans. He didn’t caricature or satirize them, so his aquatints are some of the most respected images we have. You’ll see two of these on display when you come by for dinner. Detail of the map and a place setting. So, you might be asking yourself, what does this map have to do with Three Flags Day? (Almost done with the history. Promise.) After the United States acquired the Louisiana Territory, Lewis and Clark were legally able to go a-trekking across North America. Two months after the Three Flags ceremony, the Corps of Discovery left St. Louis on their famous expedition. Prince Max’s party took much of the same route, and Bodmer’s map is one of the first finely-detailed (and most beautiful) maps of that part of the country. If the United States hadn’t scored the Louisiana Territory in this transaction (a heckuva deal, by the way), who knows when westerners would have had the chance to officially explore and document that part of the continent. The Three Flags Ceremony kicked off a new age of western exploration, and this map is an extraordinary artifact of the courageous spirit of that time. We had the king-kong,150 MB file turned into a wallcovering, and the quality is phenomenal. Even the smallest lettering on the map is clear, and the installation has proven to be a conversation piece in the dining room. To see a higher-res image of the map, click here. To learn more about the expedition, check out the text of the journals. » I see dead people. On the walls. Clockwise from top left: Charles de Hault de Lassus, Pierre Laclede, Madame Choueau, Manuel Lisa, Auguste Chouteau. Flanking either side of the map are arrangements of historical figures, many of whom any reasonably observant St. Louisan should recognize from street names if nothing else. Laclede, Chouteau, Gratiot, and eight other figures create classical arrangements in the elegant dining room. We included people who were present during the Three Flags Ceremony, and characters from the resulting Lewis and Clark expedition. The trick for us as researchers was presenting an inclusive version of history that is not always reflected in history books. Women and minority ethnic groups are often excluded from “the canon,” and we tried to rectify that as best we could. When we settled on the images, copies were printed on canvas, and we popped them into antique frames. John and Cathy requested we not label anyone. 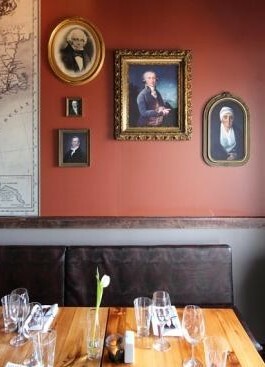 Instead, they wanted the portraits to encourage conversation with the wait staff, i.e. “Who is that guy in the fancy blue suit?” Don’t worry, no big history lesson here. To give the Three Flags staff an online guide to these faces and to prove we did our homework, we’re going to write a separate post as a who’s-who that includes all the racy anecdotes (really!) we could dig up. 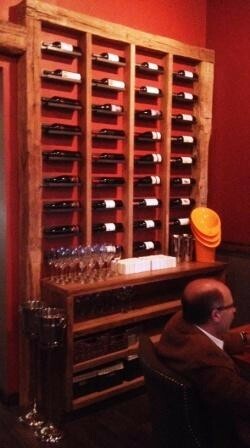 » We want a wall like this at home. 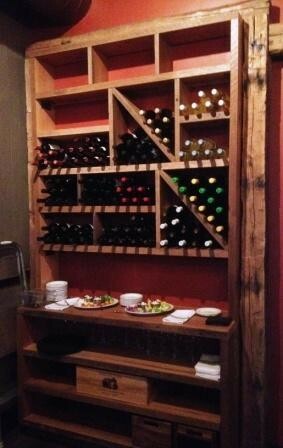 Designed and built by architects, this wine wall makes a beautiful display for Three Flags’ fine selection of wine, but it also provides storage for the dining room. Occupying the entire back wall, the arrangement of reclaimed hand-hewn timbers balances some of the finer details of the space to make diners feel comfortable and not-too-stuffy. Staff uses the generous lower shelves for wine glasses, napkins and flatware, and the counter provides space to stage food for the dining room and adjacent bar. 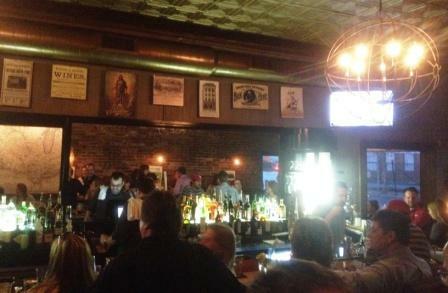 Old ads fill a funny space above the packed bar. St. Louis has a long, proud history of brewing, and you can find evidence of this in old St. Louis City Directories. Aside from beer, there are a lot of other cool things coming out of St. Louis, too. (Human hair! Doctor Butts!) To fill an awkward area above the top of the bar just below a big HVAC duct, we printed and mounted some of these unusual old ads and hung them in this space. These are coming in handy for restroom decor, too. Care to browse the directories yourself? Set aside a few hours, because you get sucked in. The ads are fascinating, and if your family has deep roots in St. Louis, you’ll probably stumble across some old relatives. Here’s a link to get you started. We’re proud of how the space turned out, but it just goes to support the exceptional food and service. (Here’s the menu. Told you, it’s amazing.) Three Flags Tavern has been John and Cathy’s dream for years, and we’re honored they let us be a part of bringing that vision to life. Come by and experience their hospitality, cuisine and atmosphere. (If you ask nicely, John will teach you how to tie a dapper bow tie.) Enjoy!